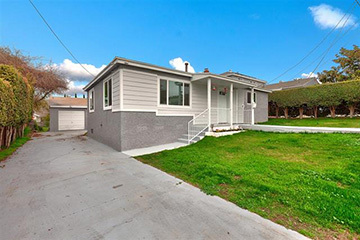 Hurry to this 2 Bedroom, 2 Bath, 950 sqft remodeled bungalow on a quiet Linda Vista cul-de-sac! An added feature includes a 240 sqft detached bonus room with vaulted ceiling and brick fireplace (possible 3rd bedroom, game room, home office or income possibilities)! New kitchen cabinets, counter tops, flooring, and stainless steel appliances! Bathrooms fully remodeled! Vinly plank flooring! Enjoy the balmy evenings around the outside fireplace! Detached garage! Ample off street parking! Zoned for 2 units!